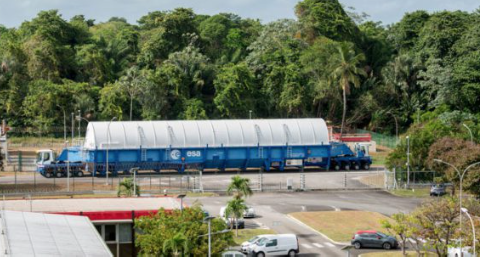 The cryogenic main stage for Arianespace’s Flight VA240 is transported across the Spaceport after arriving in French Guiana aboard the MN Colibri roll-on/roll-off ship. Arriving now to get ready for a December launch is an example of this company ensuring that everyone and everything is ready when the burners ignite and another rocket soars from this space center. Where is it and what will be launched? Elements for Arianespace’s Ariane 5 mission in December have been delivered to the Spaceport in French Guiana for the heavy-lift launcher’s second flight at the service of Europe’s Galileo global satellite navigation system. These components arrived this month in French Guiana aboard the MN Colibri, which is one of two sea-going roll-on/roll-off ships that transport launcher hardware from Europe to the South American launch site for Arianespace’s family of launch vehicles as shown in the photo. The year-end launch will orbit four more Galileo spacecraft, to be deployed into medium Earth orbit from a dispenser system on the Ariane 5 ES launcher version equipped with a re-ignitable upper stage. Galileo is designed to provide a new European global satellite navigation system with precision positioning services under civilian control. Designated Flight VA240 in Arianespace’s launcher family numbering system, the mission is targeted for December 12. 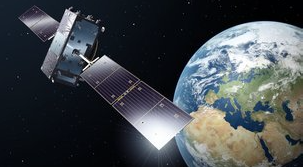 As the latest mission carrying Galileo satellites, Flight VA240 is to be performed on behalf of the European Commission under a contract with the European Space Agency (ESA). Galileo is funded by the European Union, with overall responsibility for management and implementation held by the European Commission. ESA is assigned design and development of the new generation of systems and infrastructure. Arianespace already has launched 18 Galileo spacecraft, with four being orbited on a previous Ariane 5 mission (Flight VA233 in November 2016), and the others lofted by seven medium-lift Soyuz vehicles carrying two satellites each.